I've brought this back, from brilliant Arwen who used to help me out here. I still think it's her best work. 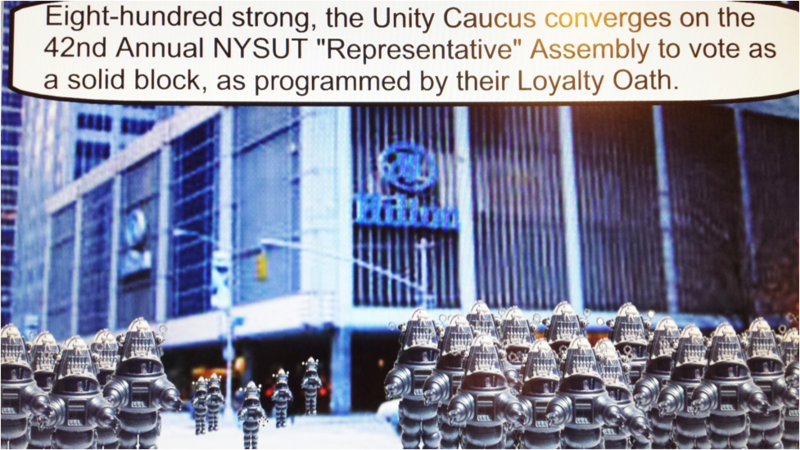 Though the dates have been updated, the story's still the same as UFT-Unity sends 750 pre-programmed voters to the NY Hilton. I'm working at a school event tonight but will swing by tomorrow to report. By special guest blogger Arwen E.
Welcome to the NYSUT Convention in NYC. 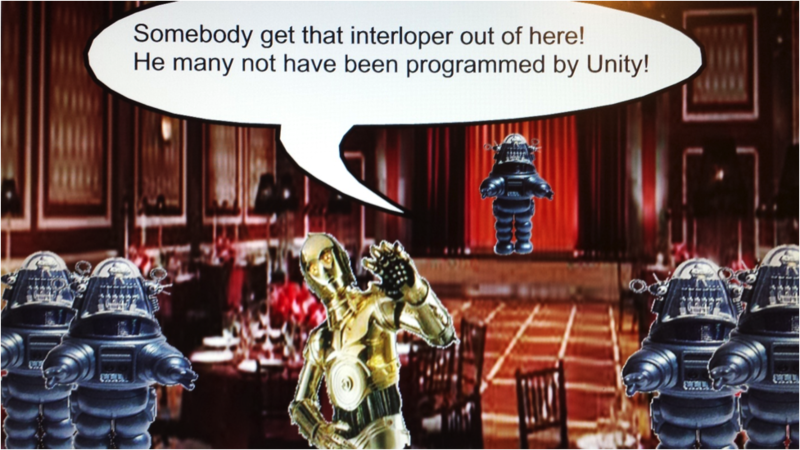 Your UFT-Unity representatives were programmed after last month's Delegate Assembly, and will be arriving at the appointed time. 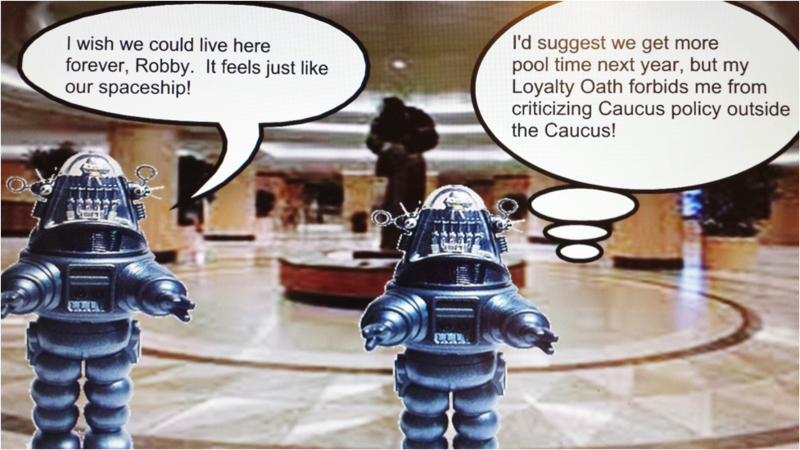 The Unity Caucus, representing about one third of NYSUT's convention votes, will send approximately 800 robo-delegates to vote according to the dictates of the Unity leadership, rather than the dictates of conscience or the dictates of a democratic representation of constituencies. It is a sad and sorry fact that although our Union is the most powerful tool we have to defend the rights of teachers, students and public schools, it has made some very poor decisions in the recent past, including support for mayoral control in the Bloomberg era, Common Core State Standards which have blighted student populations and V.A.M. which will threaten careers based on junk science and simultaneously lead to endless lawsuits. Will our Union continue to support union-bashers as well as policies to squash students and schools? Let us take an imaginary look into the Hilton during the second weekend of April to understand some very real threats. 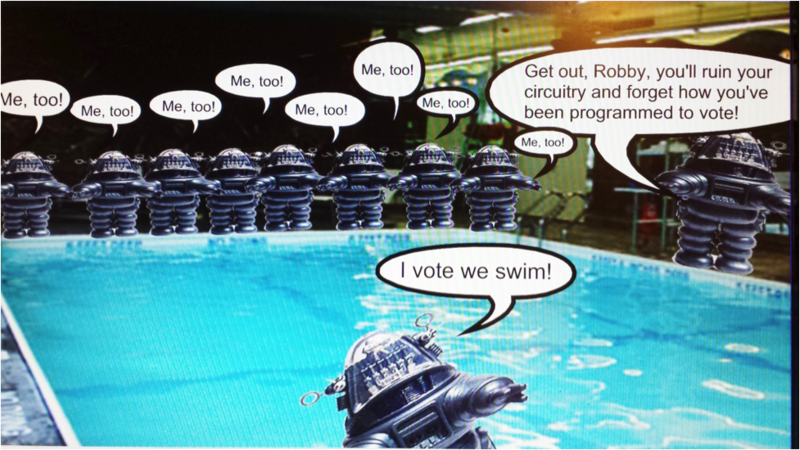 Poolside, Saturday Evening: Delegates Must Not Bend! Will this potential breach to security be contained? 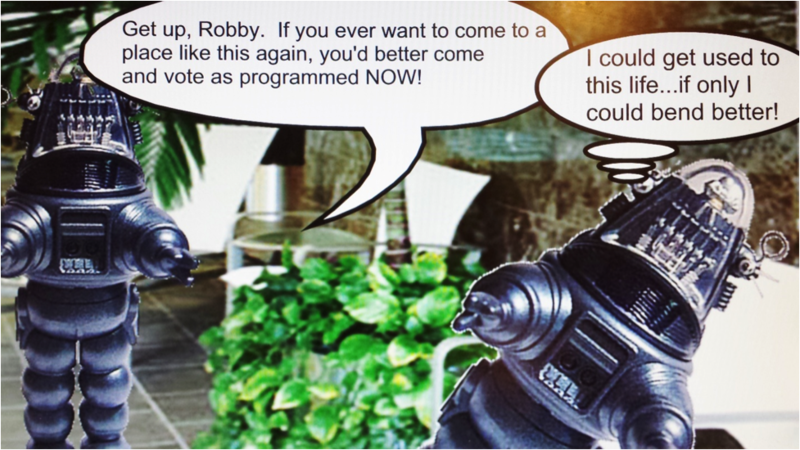 Will our heroes be contaminated by rogue programming? Or will leadership thwart this dastardly plot from their magical and trusty seat at the table? Tune in next time for another exciting adventure of UFT-Unity Caucus and their zany antics.